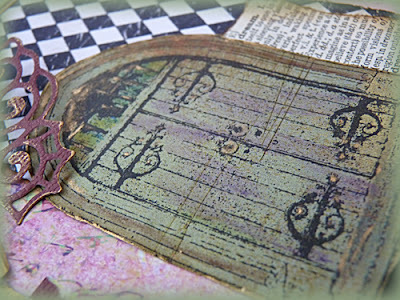 Another collage style card for Jean at Crafty Individuals. I stamped the harlequin stamp four times to create the background then used the CI gothic door stamp on some basic grey paper and die cut the Crafty Individuals Lacewing Butterfly. Not sure if you can see the Treasure Gold I rubbed on the butterfly and painted with my water brush on the door. With a strip from one of the CI background paper books, some dictionary paper, and a pen nib,it just all came together. Well alot of our snow melted yesterday but it's been really cold overnight. I hope it isn't too slippery out there and I hope you are safe and warm if you have been affected by it. Ich sehe deutlich das Gold an der Tür. Und es sieht sehr edel aus. Wie eine richtige alte und kostbare Tür. A card that tells a story - with loads of "poetry" in it! LOVE THAT! You're the queen of card!! Love love this collage one, every single detail! Wonderful collage, Brenda! I did one, maybe two and really enjoyed the collage effect, so maybe I will do another this week! Yes, I can see the golden touches and they are beautiful! Love all the details! Hugs! ADORABLE Brenda! and I am in LOVE with your masterpiece below too! wow beautiful, love the B&W in the background! 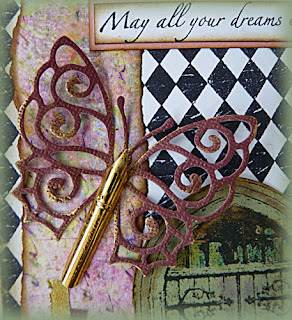 Fantastic collage card, love the sentiment and the nib on the butterfly looks great. That door tends to be such an overlooked stamp which is a pity as it is amazing especially displayed here, fabulous card Brenda. Delicious collage - the harlequin makes such a dynamic background and the elements balance one another so well! So beautiful, love the butterfly. 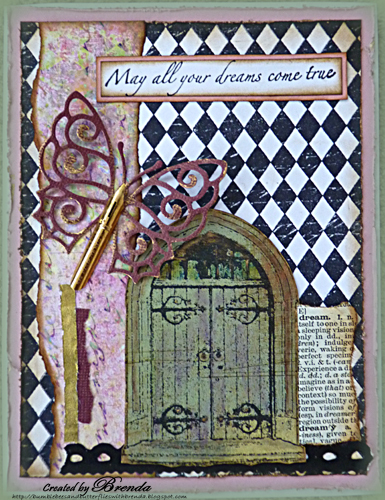 GOrgeous collage - love those sweet doors! Fab work...those doors are awesome!